Most cookbooks don't present you with that sort of dilemma. You get one recipe, take it or leave it. When I'm looking for a recipe for dinner, what I usually end up doing is going through a bunch of cookbooks and picking and choosing and assembling my own recipe based on several that seem promising. When I'm reviewing a cookbook, there's usually one recipe that cries out to be made, and that's what I make. But here were enticing pairs of recipes, each with merits. How could I choose? And no, I wasn't going to make two versions of the same recipe and have my own kitchen throwdown. So I waffled. Here's part of the dish I made. Then the light bulb on top of my head turned on. Are you seeing it yet? 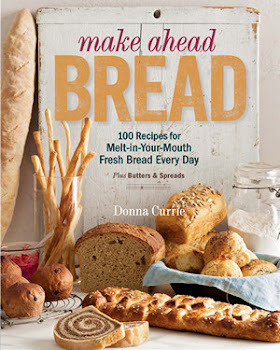 This is the perfect cookbook for people like me who like to pick and choose. Sure, someone else could simply pick one recipe and run with it, but I could take two recipes and create a middle-ground recipe based on the pair. I decided to take a whack at the pair of Chicken Cacciatore recipes. They weren't ridiculously far apart, but there were bits and pieces of both that I liked. The cooking methods were similar as well. 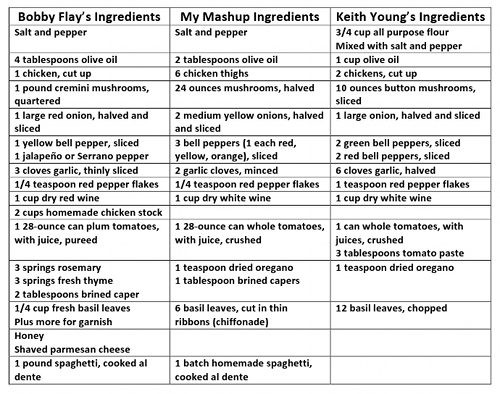 The major difference in method was that Bobby's challenger in the battle, Keith Young, dusted his chicken pieces in flour before he cooked them in oil. Bobby didn't bother with the flour. Otherwise, there were some small variations in what order ingredients were added, but it that didn't seem like it was going to have a whole lot of effect on the finished dish. Bobby's recipe suggested serving over spaghetti, but the challenger's recipe didn't say anything about it. I made my own spaghetti go to with it. If you don't want to make your own pasta, dried would be fine. If you want to make your own, try this recipe. Like I said, the recipes weren't as different as some of the Throwdown competition recipes. So it was pretty easy to combine the two. I used all chicken thighs in my version, rather than whole chickens. It's my favorite cut for this sort of dish. Since I had white wine on hand, that's what I used, but I wouldn't be opposed to using red. I made this dish once with canned crushed tomatoes, which made a very thick sauce, and once with canned whole tomatoes, which made a looser sauce. When I was merging the recipes, one thing I kept in mind was that as much as I like the chicken, the sauce with the vegetables is great on pasta, even without the chicken. So I didn't skimp on the vegetables. I think my merging worked out pretty well. Heat the olive oil on medium-high heat in a large heavy pan - a dutch oven works well. Brown the chicken pieces on both sides, then remove them from the pan. Add the mushrooms and cook until they lose their moisture, begin to brown, and the moisture is mostly gone again. Reduce the heat to medium. Add the onions, green peppers, garlic, and red pepper flakes. Stir well and continue cooking until the vegetables soften. Add the wine and cook until the liquid is reduced by 1/3 to 1/2. Add the tomatoes, oregano, and capers and stir to combine. Add the chicken and any juices to the pan, stir, and cover the pan. Turn the heat to low, cover the pan, and cook until the chicken is cooked through and tender, about 20 minutes. Taste for seasoning, and add salt and pepper, as needed. Stir in the basil right before serving, reserving some for a garnish when serving. Serve with pasta, if you prefer.